To view this video, visit https://www.youtube.com/watch?v=HtTC2DQPnkY. What do people mean when they talk about the medium of a message? Find out by watching this video. Then explore the idea of medium by doing the "Your Turn." Your Turn Think about medium. 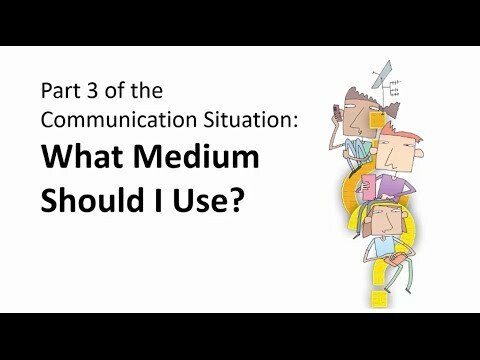 For each communication situation below, write down a medium that would be appropriate for sending the message. Then compare your answers with a classmate's and discuss what makes a medium appropriate or not. You want to invite your best friend to your birthday party. You have to tell your best friend that you won't be able to come to the person's birthday party. You need to tell your teacher that you lost your homework assignment. You want to share a historic speech with your class. You want to show a new student how to find the cafeteria. You want to tell an author what you thought of a book you read. Analyzing the Medium of a Message by Thoughtful Learning is licensed under a Creative Commons Attribution-NonCommercial-ShareAlike 4.0 International License. Based on a work at k12.thoughtfullearning.com/minilesson/analyzing-medium-message.